Massage therapy is an important healthcare service that Saskatchewan patients rely on every day. I fully support the creation of a College of Massage Therapists. Although I cannot speculate about the timing or introduction of future legislation, I understand that work is underway to establish consensus among stakeholders to establish a College of Massage Therapists. Once consensus is achieved, a government under my leadership would move to introduce legislation at that time. Yes, I support the regulation of massage therapy in Saskatchewan with legislation and yes, I would work with my Minister of Health to introduce legislation in my first year as Premier. Thank you for your interest in the Saskatchewan Party leadership campaign. Massage therapists provide a valuable service to the citizens of Saskatchewan. Massage therapy is an important part of the continuum of care that is vital to everyone. It is important that member organizations work together to provide valuable service, protect the public, and ensure that continuous learning takes place. Through cooperation and collaboration with all massage therapists, the citizens of Saskatchewan will be served very well and will continue to receive best in world services. You have put forth important reasons to establish standards of professional conduct and I encourage you to continue the conversations already underway. By so doing, you are ensuring that all massage therapists in the province will strengthen and grow under a newly established organization. Yes. 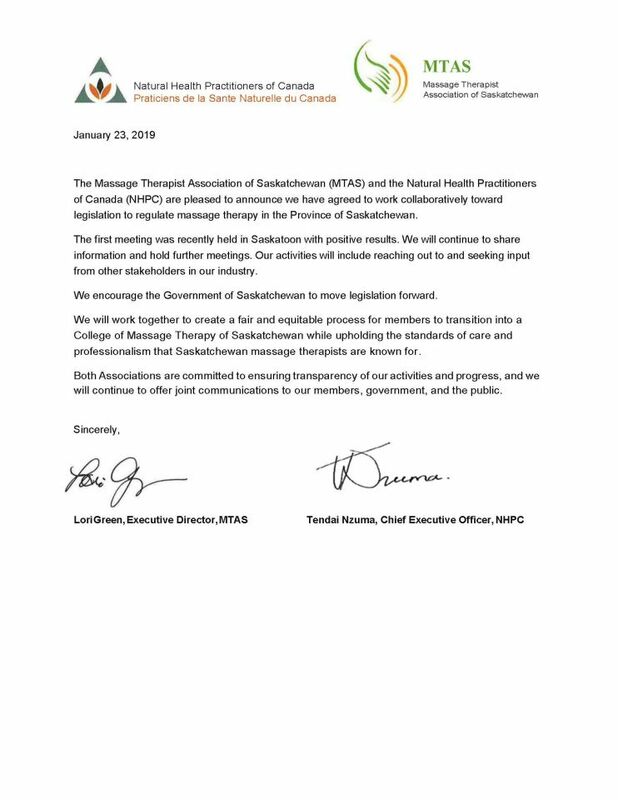 The status quo is not ideal, and massage therapists and Saskatchewan people should be able to rely on a robust regulatory and discipline system for massage therapy. I can’t commit to introducing draft legislation I haven’t seen, but I would work with massage therapists and stakeholders to ensure the prompt introduction of legislation to create an inclusive and effective regulatory body for massage therapy in Saskatchewan. As a physician, I recognize the importance of self-regulation in ensuring a profession is able to maintain the trust of the public through clearly defined licensure and code of conduct. I would be very happy to work with the MTAS and the Ministry of Health to study legislation in other jurisdictions and chart a course to the expedited development of a regulatory body that will help to protect the public and support the health professionals working in the field of massage therapy. Of the candidates who responded, only Gord Wyant committed to introducing the legislation during their first year as Premier. Saskatchewan is one of five provinces that do not have legislation regulating massage therapy. Currently in Saskatchewan, anyone can call themselves a RMT and establish a massage therapy practice. Legislation would give a regulating body the ability to develop a standard of practice and education, designate the qualifications required to be a RMT and create a governing body responsible for public complaints. “We will be sharing the responses we have received from all the leadership candidates with our over 850 members and the public, and will be encouraging everyone to buy memberships in these parties to vote for the candidates that are willing to support the introduction of legislation,” Green said. The deadline to purchase a Saskatchewan Party membership to be eligible to vote is December 8th, 2017 and the deadline for the NDP is January 19, 2018. People who use massage therapists are at risk because the province hasn't yet regulated the profession, says the executive director of the Massage Therapist Association of Saskatchewan. "For the past two years, the provincial government has had draft legislation ready to introduce that would regulate massage therapists in Saskatchewan, just as they are in many other provinces," said Lori Green. Green said the association expected the legislation to be introduced this fall. But that hasn't happened because, as the Ministry of Health said in an emailed statement, "While we have seen some progress, stakeholders were unable to agree on certain key issues, particularly how to grandfather current practitioners into a new regulatory college." "Given that consensus has not been reached, it would be premature to introduce legislation at this time." Green spoke outside Saskatoon provincial court on Tuesday, where former massage therapist Mark Donlevy received yet another charge. He is now facing nine allegations of sexual assault, dating from when he operated a massage business from his home. He has a preliminary hearing scheduled for January. The massage association has a code of ethics and standards and practices for its 800 members. But Green said there is no way to make sure all therapists meet the standard. "What happens here is we have no real teeth, we have no law or regulation behind us, so at best all we can do is remove somebody from our membership," she said. Green said she cannot understand why the province is not coming forward with the legislation. It already regulates other health-care professions, like chiropractors and physiotherapists. "Why wouldn't they want the same for massage therapists? Why wouldn't the government move forward and protect the public?" The Ministry of Health insists that the provincial government is still working on regulating massage therapists in Saskatchewan. Saskatoon, SK: An appearance today in a Saskatoon court by a massage therapist charged with multiple counts of alleged sexual assault involving patients demonstrates the urgent need for provincial legislation to better protect the public according to the Massage Therapist Association of Saskatchewan (MTAS). Currently, anyone, even those with little or no training, can call themselves a massage therapist. There is no professional authority that regulates massage therapy in Saskatchewan, as is the case with most other health care providers including chiropractors and physiotherapists. MTAS is again calling on the provincial government for action to protect the public. “For the past two years, the provincial government has had draft legislation ready to introduce that would regulate massage therapists in Saskatchewan just as they are in many other provinces,” said Lori Green, MTAS Executive Director. “We urge the Minister of Health to introduce legislation this fall,” said Green. After the most recent series of consultations MTAS expected that legislation would be introduced by the Wall government this fall but were disappointed to hear recently that would not be the case. “The public must be confident that only massage therapists who are highly trained, professionally certified and in good standing with a regulated authority can call themselves a Registered Massage Therapist and use the protected title ‘RMT’,” said Green. MTAS is comprised of over 800 registered massage therapists in Saskatchewan and is dedicated to the maintenance and improvement of the profession of massage therapy and to the health and protection of the public. July 1, 2017—the private right of action comes into force when the 3-year implied consent grace period ends. This provision allows those who receive a commercial electronic message (CEM) without giving consent, or who receive a CEM which fails to comply with any of the Act’s technical requirements, to bring legal action against the sender of the message. It is anticipated that the private right of action will provide fertile ground for lawsuits. The maximum penalty is $1,000,000 for each day on which a contravention occurred. Does Canada's Anti-Spam Legislation Apply To Me? No type of organization is exempt from Canada's Anti-Spam legislation. If you use electronic channels to promote or market your organization, products or services, Canada's Anti-Spam Law (July 1, 2014) may affect you. Effective July 1st, 2017, to send a commercial electronic message (CEM) to an electronic address, you must have the recipient's consent, to identify yourself, to offer an unsubscribe mechanism and to be truthful. Businesses should ensure they obtain a consumer's consent prior to sending commercial electronic messages. They must properly identify themselves in the message and provide a functional way for the recipient to unsubscribe from receiving future commercial messages. Don't send a message without their consent. "Yes, please contact me"
Provide an opportunity for customers and clients to say no. "No thanks"
Be truthful in advertising. "Taxes included"
​This resource, which is intended to provide a plain language explanation of some of the requirements under the Act, is not to be considered as legal advice, an interpretation of any legislation or regulations, or as a settlement or commitment on behalf of the Enforcement Agencies for Canada's Anti-Spam Law. What does this mean for you as a therapist? You should update your website and client consent forms (paper and electronic) to include a statement outlining your use of electronic messaging. Include a space for the client to acknowledge this statement, and give them the opportunity to opt out if they prefer not to receive these messages. There should also be an "unsubscribe" option on all electronic messages you send. The Massage Therapy Association of Saskatchewan Inc. would like to make you aware of a five-day course being offered through Raynor College of Massage and Natural Therapies in Saskatoon claiming to train individuals as Massage Therapists. We would like to advise our members and the public that we have contacted the Government of Saskatchewan post-secondary University and Private Vocational schools, to ensure they are aware of Raynor College of Massage and Natural Therapies. They will be in contact with this provider but have stated there is little they can do to prevent this. They have advised us this is a "buyer beware situation." A “graduate” of a course such as this will find the $2500.00 + tuition fee will buy them absolutely no credibility working in Saskatchewan and in fact Canada. Massage Therapy research is providing information that continues to be recognized as legitimate healthcare. To practice, individuals need to be able to understand anatomy, pathology, physiology and contra-indications of Massage. The standard education in Canada is based on the Interjurisdictional Competency and Performance Indicators, which has a thorough explanation of the basic education needed to treat individuals. A typical Massage Therapist will complete Massage Therapy training in approximately two years as a full-time student. Please beware and when viewing advertisements that claim a short circuit to education contact the Government of Saskatchewan, Advanced Education (306) 787-7381 or feel free to contact MTAS at 306-384-7077. Individuals who are seeking treatment are to be advised in Saskatchewan we currently are not legislated. Always ensure that your Massage Therapist has completed their education in a recognized Massage Therapy School. An easy way to ensure you are in the right hands, ask if they are a member of MTAS. Touch U is closed for new course purchases as of midnight EST on January 2nd, 2017. All previously purchased courses and certificates can still be accessed by members for one year (January 2, 2018) but no new purchases can be made. Please send any certificates of completion to the MTAS office at your earliest convenience, so we can update your con-ed file. Welcome to the Massage Therapist Association of Saskatchewan, Inc. This website is designed to provide valuable information to serve massage therapists, protect the public and to create and enhance the public understanding of massage therapy. MTAS has made every attempt to verify the accuracy of information provided on this website, but does not assume any liability for unintentional errors or accidental omissions.